Thomas i Punkt is a family of stores. Established in the 70s it became the go-to fashion place – with numerous locations in the city. People came here from all over Germany to shop modern and cool brands. It was the single best spot to buy an expensive designer wedding suit and new sneakers for skateboarding all under the same roof. Now, they are reduced to three locations in the city. But, wow, are those shops spectacular. There are two side by side at the Gänsemarkt. But the shop on the Mönckebergstrasse is an attraction all by itself. They occupy the whole ‘Hulbe Haus’, a 100 year old renaissance house right next to the St-Petri-church. I think, with all its little details, it is the most beautiful house in Hamburg. Thomas i Punkt offers pretty much everything: High priced brands like Comme Des Garçons or their own brand OMEN (manufactured in Hamburg). 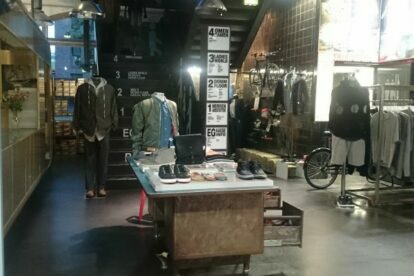 The best streetwear labels (Obey, Vans or Clepto from Hamburg) and cool sneakers can be found in the basement. And in between you will find precious items for him & her. The staff is always incredibly nice and helpful. They don’t mind if you are just there to take pictures or simply enjoy the atmosphere.